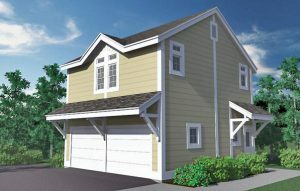 The Hip Garage was designed to coordinate with the Hip Cottage. Used together on a site, they create a compound of complementary forms and shapes. This plan provides (2) parking bays with a vented cupola allowing heat to escape. 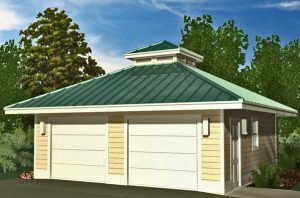 The Porches Garage plan has a loft with a kitchen, bathroom, and storage closet which is great for guests or a studio apartment. The 1st floor provides (2) parking bays with a separate stair entrance to the 2nd floor. 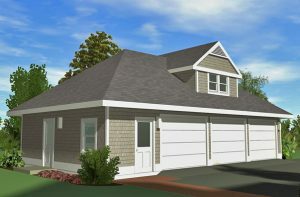 The Shingle Garage plan has a loft which can be used for a storage attic or play room. If desired, it can be finished now or later as a studio apartment. The 1st floor provides 3 parking bays with a storage or pool equipment room and a separate stair entrance to the 2nd floor.